This week it was publicly acknowledged at the highest level of British policing that as a country we have a serious problem with far right radicalisation and the threat of far right terrorism. There have been four far right terrorist attacks foiled by the police in the UK in 2017 alone. Most of the extremism is focused around a hatred of either Jews or Muslims. Neo Nazi organisations like National Action have openly called for violence against Jewish communities and there has been a 40% increase in attacks on Muslims in the last year. In my work with anti-hate organisation Resisting Hate I regularly encounter hate across a wide range of social media platforms. Our group have been instrumental in getting hundreds of these haters removed. But hate is the Hydra of the internet – get one hater down and another ten pop up to take its place. The only way to stem the flow of extremism and abuse on social media is to tackle the problem at source. And by that I mean to remove the high profile hate preachers from their platforms and consign them to the oblivion in which they belong. We have reported Tommy Robinson hundreds of times as an organisation. We have reported every hate tweet he has ever put into the ether. We have supplied hundreds of links and screenshots to Twitter, Facebook and You Tube. The social media giants have taken no action at all. His accounts are still active. 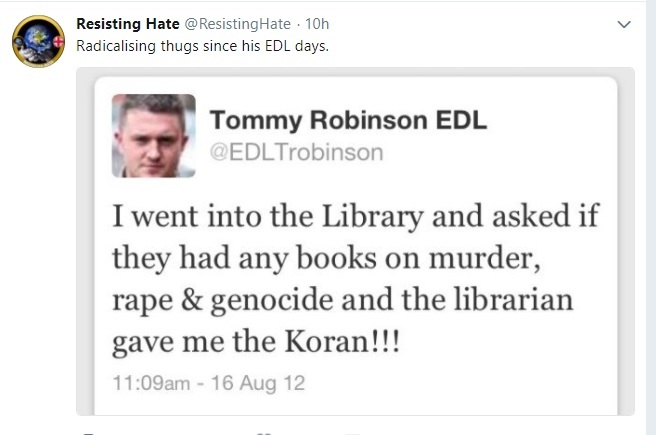 We know the material published by Tommy Robinson warps and twists the minds of the vulnerable. We know the 394,000 followers of his Twitter account are being exposed to a daily diet of lies and hatred that is indoctrinating those who follow him to hate Muslims. This man is publicly breaking the hate speech laws of the UK and yet again I am asking why nothing is being done about this? Why are we allowing the people of our country to be put at risk by the bile spread by hatemongering idiots like Robinson? And it isn’t just Tommy Robinson either. Twitter have decided Katie Hopkins doesn’t break their terms of service despite her posting tweets like this on a regular basis. You Tube are happy to host videos where White Supremacists howl for race wars. Facebook have denied that Britain First contravene their community standards despite eliciting death threats and violence from their followers. Anne Marie Waters posts blatant racism to her followers and (since disbanded but members still active on social media) Liberty GB threaten to blow up mosques. All these haters attempt to legitimise their views, some even having the audacity to try to stand for political office! They claim to stand for free speech and to represent the views of the British public. But the truth is that these people represent nothing but a threat to our country and the people who live in it. Fortunately, without exception, all these hate preachers have a very limited offline following – Britain First has a FB audience of over 2 million but rarely manage to summon more than thirty knuckle draggers to their public meetings. ‘For Britain’ have actually had to stop holding meetings as no respectable venue in the UK is willing to host them. Most of the individuals on social media who support these high profile haters are unwilling to put their name to their views and certainly unwilling to face the consequences of openly promoting hate in their local communities. Once the likes of Robinson have their Twitter and You Tube accounts closed they will be effectively cut off from their audience and unable to radicalise vulnerable young people with their brand of division and vitriol. The problem begins online and it needs to end online. 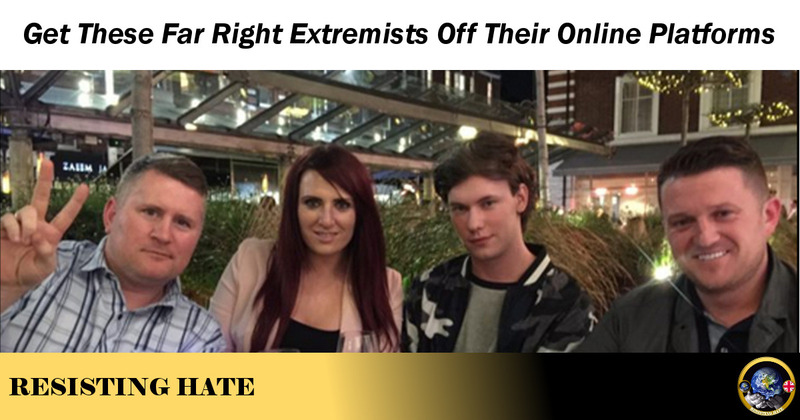 Get these far right extremists off their online platforms. Great job guys, the amount of lies these people feed their followers is out of this world, if anyone else from other communities in this country or even abroad posted half of what they do they will probably been in terrorists list and locked away for years without even fair trial. The government is fully aware of their activity and yet it allows it to happen. The problem needs to be addressed with Theresa May and the government. How can I get involved with this organisation . I want to offer my input and business experience to this movement going and help raise funds through crowdfunding and help bring lawyers on board to take on these issues . More PR please , more followers , more awareness .